1. 30 levels of damping adjustment allows for settings to match any road conditions. Such a wide range of adjustment allows the damping to be adjusted to satisfy any driver at the extremes of their vehicles abilities. 2. KT Racing uses Italian IP damping oil. This oil retains its advertised viscosity in extreme operating conditions and possesses excellent anti-foaming properties, preventing reductions in performance during extended periods of at the limit driving. 3. The multilayer shock design utilises Japanese made, high quality NOK oil seals. These ensure the air and oil sections of the suspension remain isolated, while allowing smooth movement of internal parts. 4. SAE9265 high rigidity steel is cold rolled to produce the springs. These have a long service life and resist collapse or distortion. 5. 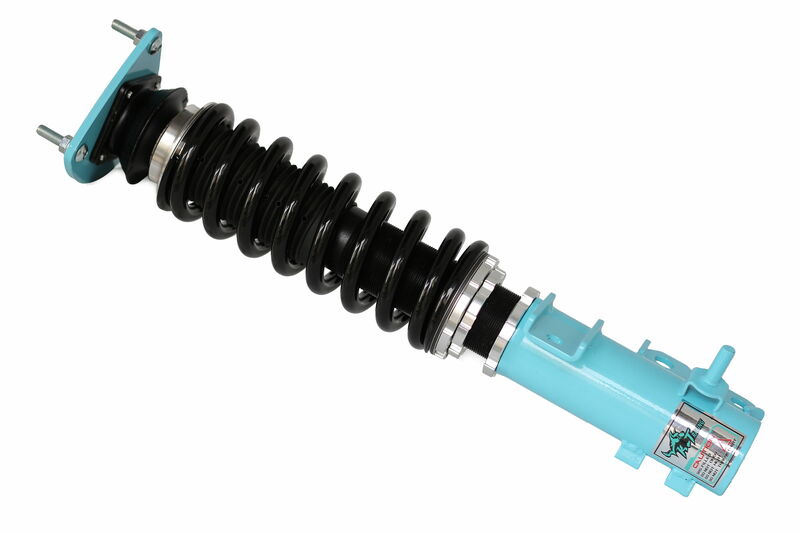 The high quality steel shock absorber piston and rod is given a hardening treatment to further reduce the possibility of deformation under extreme conditions or wear causing internal leaking. KT Racings piston design offers increased damping force at low velocities, while maintaining a linear damper feel at high piston velocities giving a refined ride quality. 6. Forged 6016 aluminium upper suspension mounts, matched with Japanese made Koyo bearings ensures durability. The rubber compound used is not only long wearing, but chosen to reduce transmission of road noise into the chassis, providing a good balance of performance and comfort. 7. CNC milled pillow ball top mounts with Japanese made Koyo bearing are also available, providing the ultimate in suspension adjustment.